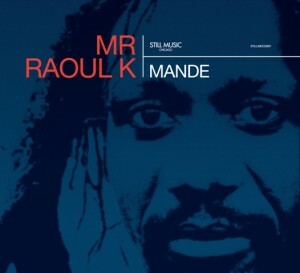 A world citizen has returned to the home and reached an essential station in his musical career when after an inspiring trip to Mr Raoul K’s native Côte d’Ivoire his new album “Mande” is published on Chicago’s fine label Still Music. Already with the first releases on his own Baobab imprint Mr Raoul K showed increasingly more qualities than just being “mysterious” and “exotic” Lübeck-based producer of African origin. Despite of pursuing a moderate release schedule he quickly became a preferred deep house producer in Germany, his Wahlheimat since 1992. Now Raoul Konan N’dah Kouassi has completed his recent creative phase on a Chicago label, with “Mande” consisting of explosive combination of the artist’s rhythm-oriented African background, reserved machine funk and best picks from the school of tribal house. Mr Raoul K remains faithful to the main elements of his sound but is ready for some surprises to honor his musical heritage, by means of assembling his former band in the African home. His music expresses down-to-earth attitude and strong ties to the Mother Nature, except in the introductory “Somassai” which might be easily placed between high-rises of Abidjan. It’s a calm morning in the first rays of sun, but the call of concrete jungle can’t be resisted when synthetic horns and rhythms start inflating the atmosphere for vibrant 14 minutes. After the hybrid of machine funk and pulsating bass, Raul Orellana’s Mauresque guitar has been borrowed for a restless tribal cut “Bardot”. Distant thunder on delicate dubs lead “Sierra Leone (Deetron Mixdown)” to a more glamorous path, with synth hooks showing the way to the distant lights of cosmic disco. Quite unexpected change comes with “Belebeleba”, which is an authentic folk song with a full set of vocals and percussion made in Western Africa before the vinyl version concludes with “Rainforest Chicagomix”, a relaxing house tune. The CD version features some extra tracks – “Rainforest Coratouchmix” and two ethnic versions of the title track “Mande” plus a documentary about the artist and his musical background. A majestic work spanning several continents and cultural influences. This is going to be on fire. Rainforest is my favorite. yes yes, it just do good 🙂 I Love this. Need follow your next productions.